Life on Earth depends on photosynthetic carbon dioxide (CO2) fixation to form organic carbon. Plants take atmospheric CO2 and transform it into organic molecules such as glucose. This process evolved in cyanobacteria and was later conveyed to eukaryotes, giving rise to plastids in algae and plants. Researchers have now discovered a new protein which is involved in this complex process; it regulates the intake of CO2 into the cell. Khaled Selim and Professor Karl Forchhammer from the Interfaculty Institute for Microbiology and Infection Medicine (IMIT), together with colleagues from the Max-Planck Institute for Proteinevolution and from the University Rostock, describe their finding of the conserved cyclic AMP receptor protein, SbtB, in the latest edition of Proceedings of the National Academy of Sciences (PNAS). SbtB participates in the sensing of fluctuating ambient CO2 concentrations to adjust CO2 fixation to different environments. SbtB represents a new member of the PII signal transduction superfamily, known for binding the energy carrier molecules ATP and ADP - a kind of battery for the cell. The newly discovered protein, however, also binds the cyclic nucleotide cAMP, which plays fundamental roles in all organisms for signalling the state of carbon metabolism. Up to now, cAMP was chiefly known for being a key messenger molecule, required in the maintenance of the organisms glucose balance - used for instance in regulating blood-sugar levels. 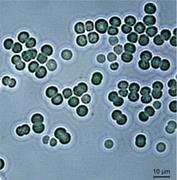 SbtB is the first protein known to bind cAMP to regulate the CO2 metabolism in cyanobacteria. In identifying SbtB, the researchers have found new principle of carbon sensing through cAMP, which is important for acclimation to varying Ci regimes in the ecological niches of cyanobacteria. Cyanobacteria, also known as blue-green algae, are among the oldest group of organisms on Earth; knowing more about their workings offers clues to very early life on the planet.